For those who want to display large content the 1x3 DisplayPort Extender Splitter is for you. Able to extend an image onto 2 or 3 displays, this device is perfect for multi-tasking, but can also split an image so the same image is repeated on up to three connected displays. 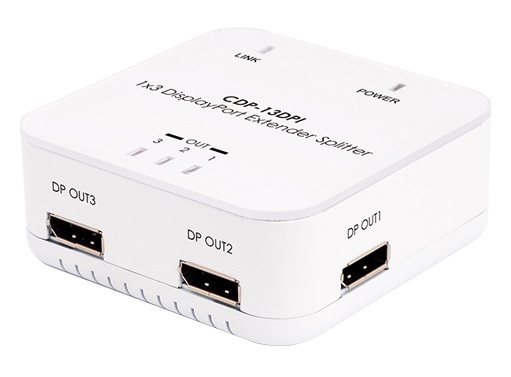 This 1 by 3 DisplayPort Extender Splitter allows users to enjoy images or video in HD resolution up to 1920 x 1200 on multiple monitors from a single digital output port. The 1 by 3 DisplayPort Extender Splitter is a useful device for extending displays and splitting images. • Supports link rates of 2.7Gbps (HBR) and 1.62Gbps (RBR) from the source. • Input source equipment such as a PC or any DisplayPort output device with a DisplayPort connection cable. • Output display such as a PC monitor or any DisplayPort input display with DisplayPort connection cable.